Congressional Black Caucus travels to Cuba… and where the Hispanics at? Thank you very much. African American Congress members are showing they care enough to reform the obsolete U.S. policy towards Cuba and the Cuban people. And while they promote change, surely they will enjoy it – jeez who wouldn’t want to travel to Cuba! 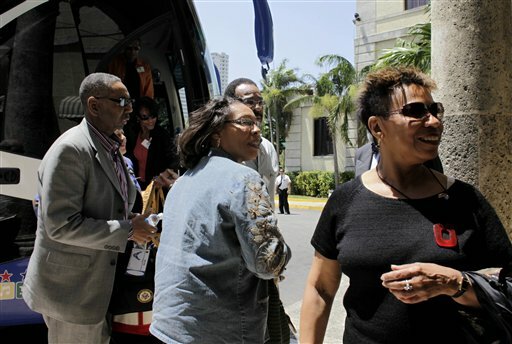 HAVANA (AP) — Seven members of the Congressional Black Caucus arrived in Cuba on Friday to discuss improving relations with the communist government amid speculation that Washington could ease travel restrictions to the island. All Democrats, the lawmakers planned to be in the country six days and meet with new Foreign Relations Minister Bruno Rodriguez and Ricardo Alarcon, the head of parliament, among other officials. Joining Delegation leader Rep. Barbara Lee D-CA were Reps. Marcia Fudge, D-OH, Mel Watt, D-NC, Emanuel Cleaver, D-MO, and Bobby Rush, D-IL. ; as well as fellow California Democrats Mike Honda and Laura Richardson. Now, I wonder why the CBC members were not joined by members of the Congressional Hispanic Caucus – CHC. After all, Cubans are supposed to be Hispanic according to the racist identity promoted by the US government, right? Don’t get me wrong, I do appreciate some of thhe work that the CHC has done for the communities of Latin Americans –and their descendants- in the United States. But this trip to Cuba is another proof that sometimes the so called Hispanic leadership is out of touch with our true interests. Cuban people for instance, have suffered the consequences of an obsolete and useless policy that intends to punish the Cuban communist government, but instead promotes poverty, the separation of families and tragedies of people fleeing to the U.S. risking their lives. Visits to Cuba by members of the U.S. Congress are not new, but this one comes three days after a bipartisan group of senators proposed legislation that would prevent the president from stopping travel to Cuba except in extreme cases. An identical bill in the House has 120 co-sponsors. My critic here goes to the CHC because that group –perhaps created to imitate the CBC- has done little to support real change of the U.S. policies towards Latin American countries, especially towards governments that are promoting positive changes including Venezuela, Ecuador, Argentina, Bolivia, Brazil and others. Instead the CHC has sided with corrupted and abusive governments like Peru, Colombia, El Salvador, Dominican Republic and Panama. Here comes the racial and social issue. Many of the CHC members are right-wing conservative of European heritage, who are working in behalf of the interests of Americans who have connections with the elites of Latin America. In the countries of the western hemisphere, most of the people are not Hispanics but Afro descendants and Native peoples and most of them are poor and oppressed… by the Hispanics precisely. So here is a call of attention for the CHC Congress members: you can learn something from your African American colleagues, and since it seems that you like to copy them a lot this trip to Cuba may be one thing you must repeat immediately. Today is a nice day in DC, I will be blogging later.